From the stunning topiaries to the outdoor kitchens, Epcot knows how to welcome spring with open arms! This post contains affiliate links, which means I receive a small commission if you make a purchase using these links. It is no additional cost to you, and I cross my heart I only recommend products and deals that will help you get the most out of your travel/Disney experience. First things first: grab a park map and times guide as soon as you enter the park. These will not only help guide you through your day at Epcot, but will also inform you of show times, character appearances, entertainment hours, and more! You will also want to pick up one of these awesome Garden Passports from the Festival Center, Festival Merchandise locations, the Garden areas, or at any of the 13 Outdoor Kitchen locations. This little bad-boy is the key to the kingdom if you will. It is a guide to everything that I will mention below and is a really fun souvenir to help you get the most out of the Flower and Garden Festival. The new addition for 2017’s Garden Passport were stickers to mark each destination you visit at the festival, whereas in 2016 you collected stamps at the locations. I like the stickers much better. It makes it feel like a scavenger hunt, which I absolutely loved! Limited edition shirts, hats, Mickey ears, mugs, cups, canvas bags, backpacks, pin trading, stuff for your garden(of course), plus so much more merchandise with the Epcot Flower and Garden Logo are available during this special event. for this event are Limited Release, which means only a certain amount was made and once they sell out they are gone. If you are a pin collector, like me, you’re gonna want to get these pins as soon as you get to the park. Flower and Garden Gift Card: Flower and Garden gift cards are available at any Festival Merchandise location. Just load money ($15.00 minimum) onto the card and conveniently pay for food, merchandise, and more. The card has a convenient wristband and is also scratch and sniff!! The 2017 gift card smelled like oranges! Your Times Guide will show you the times you can meet all of your favorite characters, and your guide map will show you the location of where you can find them. The newest characters Baymax from Big Hero 6 and Joy&Sadness from Inside Out were introduced in 2016, along with longtime favorites such as Snow White in the Germany Pavilion, Belle in France, and Aladdin&Jasmine in Morocco…just to name a few. During the Flower and Garden Festival, you can find fresh farm-to-table selections. Located in pop-up outdoor kitchens throughout World Showcase….these are an absolute must! For a Full List of the 2018 Outdoor Kitchens with Menus Click Here. The horticulturists at Disney create one-of-a-kind artwork by changing shrubbery into your favorite Disney Characters. With over a 100+ topiaries to see around Epcot, your best bet is to use your Garden Passport as your guide. It’s a lot of fun to check off each topiary one by one as you see them! The following topiaries are a mix of pictures I took from the 2016 & 2017 Flower and Garden Festival. Some of these topiaries change year-to-year. Both Hook and Tick-Tock Croc were replaced by Tinker Bell in 2017. There are also stunning garden displays set up around the park. You can also check these off inside your Garden Passport, as well as use your Park Map to find them. During the Flower and Garden Festival, Epcot hosts a Garden Rocks Concert Series. Every Friday – Monday at 5:30, 6:45, and 8:00 PM, a different “throwback” band performs on the Garden Stage. Located in the America Gardens Theater. Bands from 2017 Concert Series included Blood, Sweat and Tears, the Plain White T’s, and Berlin. Check your Times Guide for more info. 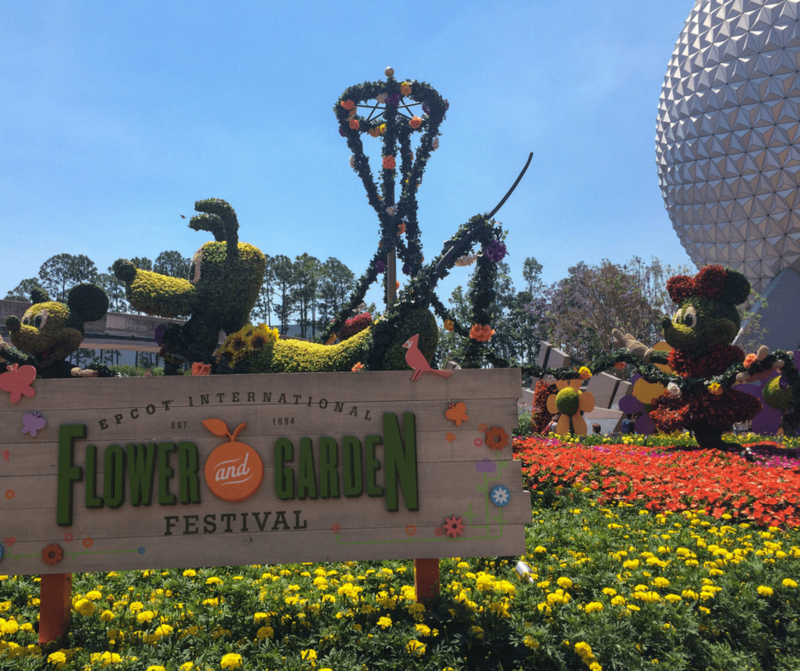 The 2018 Epcot Flower and Garden Festival starts February 28th and ends May 28th, 2018. Be sure to Follow the Symbols on your Park Guide to get the most out of your Epcot Flower and Garden experience! The 2017 Disney Gift Card also smells like oranges, and it’s shaped like one too! Aw wow! It looks incredible. It really is!! Disney goes all out! Found you on the fb page for Disney Bloggers… great post and pictures! This is great! I worked at Epcot in 2011 for a short time and loved all of the gorgeous flowers! Thank you!! ☺️ It is truly stunning to see! I can’t wait to go back in May and see everything that’s been added for 2017! I have always wanted to go to one of the festivals in Epcot! Great pictures!